Interested in participating in potential multi-million dollar NASA contracts? 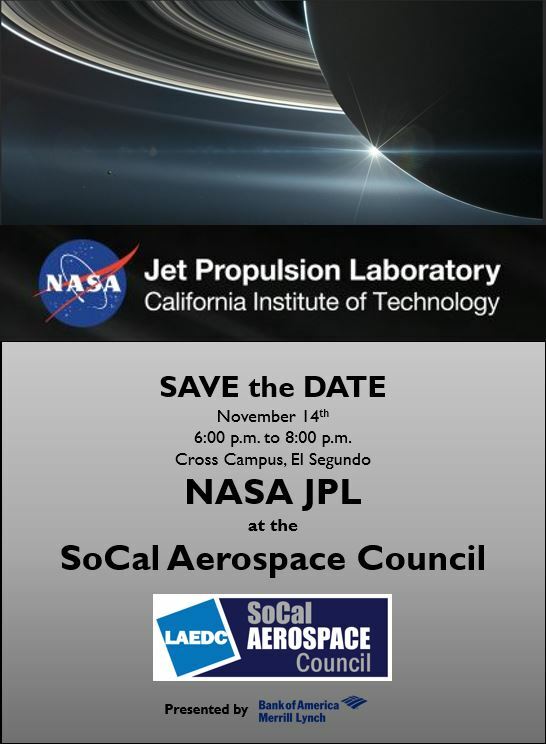 LAEDC’s upcoming SoCal Aerospace Council event will bring you together with Jet Propulsion Lab (JPL) executives to discuss upcoming missions and projects, and offer inroads for your business to work with JPL on potentially large contracts. This is part of the highly successful California SmartMatch program, matching suppliers with prime OEMs and tier one aerospace organizations. JPL is seeking a variety of small business partners for various technologies, especially electronics manufacturers. JPL is also hoping to work with Hub Zone companies and companies in phase three of the Small Business Innovation Research (SBIR) program. Ample opportunities for near-term contracts, all under one roof. Engage with senior JPL officials who can help walk your firm seamlessly through the process. KEYNOTE SPEAKER: Mark Davidson, Small Business Innovation and Technology Partnerships Office, California Institute of Technology’s Jet Propulsion Laboratory. Mark Davidson is a member of the California Institute of Technology’s Jet Propulsion Laboratory office of the Small Business Innovation and Technology Partnerships Office and NASA’s Western Water Applications program office. Mark has held positions as the Corporate Treasurer and Head of Investor Relations at Wesco Aircraft and as the Corporate Director of Business Strategy at Northrop Grumman Corporation. He was responsible for evolving the company’s portfolio strategy associated with all defense electronics including space, air, ground, maritime domains and naval systems including navigation, ship, weapons and engineering control. In this function he also participated in M&A, Joint Venture, divestitures and spin-off activities. He served as a Presidential appointee as the Deputy Assistant Secretary of the Navy for Reserve Affairs and is a retired Navy Captain. Mark holds an MBA from the U.S.C. Marshall School of Business, a Diploma from the U.S. Navy War College Command & Staff program, and a BA in Physical Geography from U.C.L.A.